You will need a writing utensil, your cut-to-size cushion, fiberfill, a tape measure, straight edge, stapler and scissors. Fiberfill Sheet Width = (24") + (4") + (2") = 30"
Fiberfill Sheet Length = ((24" + 4") x 2) + (2") = 58"
Required Fiberfill Dimensions = 30" x 58"
Fiberfill Sheet Width = (30") + (6") + (2") = 38"
Fiberfill Sheet Length = ((24" + 6") x 2) + (2") = 62"
Required Fiberfill Dimensions = 38" x 62"
After calculating the dimensions for your fiberfill covering, measure and cut the material to size, as shown in picture 1-1. Using the straight edge as a guide may be helpful in ensuring straight cuts. 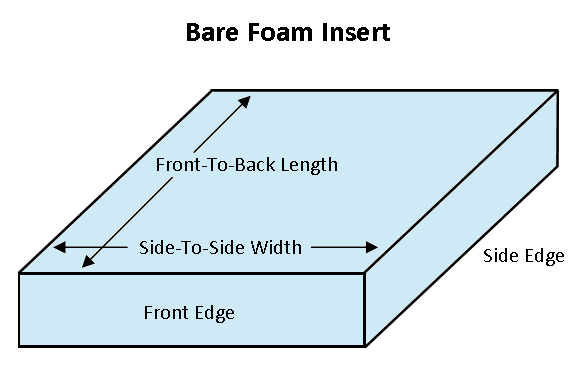 Once the fiberfill is cut to size, fold the material over the cushion and center the foam with even overhang on the sides and back, shown in pictures 1-2 and 1-3. Be sure the front of the cushion is covered by the smooth, unstapled middle of the fiberfill sheet. Begin attaching the fiberfill at the back of the cushion. The best way to hold the cushion in place during this process is to wedge the cushion vertically between your body and the edge of the table. The front edge of the cushion should be facing down and the back edge to be stapled should be facing up. With the cushion in place, begin by gently pulling up and folding the outer fiberfill lip down toward you, as seen in picture 2-1. Then, gently pull the closer fiberfill overhang down over the other, as seen in picture 2-2, like you're wrapping a gift. Pinch the edge of the two sections of fiberfill and staple the two pieces together in the middle of the edge as seen in picture 2-3. Staple every 2" to 3" along the back of the cushion. Do not staple all the way to the edges of the fiberfill however, as shown in picture 2-4. Leave about 2" of unstapled fiberfill on either side. Rotate the cushion so one of the open, unstapled sides is facing up. Beginning from the backside of the cushion which you just stapled, begin by folding the overhanging fiberfill down from the back of the cushion as shown in picture 3-1, stretching the fiberfill gently as you make the fold. Then fold the top lip of fiberfill over that, shown in picture 3-2. Holding that fold in place, repeat the steps for the bottom lip as shown in picture 3-3. That bottom lip will be folded over the top part like in picture 3-4, and then held in place by two or three staples. Only staple a couple inches in from the back edge however, as you will finish from the front and move back to complete the cushion later. Repeat the back corner-covering steps from the other side so that both end up matching picture 3-5. Instead of working from the back to the front, you will now fold and staple the front of the cushion and close the gap in the middle to finish. Push down the center of the front overhang against the edge of the foam as shown in picture 4-1, remembering to stretch gently as you fold. Fold the top lip down like picture 4-2 and then the lower lip over it, as in picture 4-3. Make sure the lip that winds up on the bottom of the fold at the front of the cushion is the same one at the bottom on the back, so you don't have twisted fiberfill meeting in the middle. Put two or three staples in the fiberfill to hold the folds in place. Repeat this process on the other side of the cushion. The only unstapled area at this point should be the middle of each side of the cushion. Instead of working from one end to the other, start at the middle of the cushion and fold down the overhanging fiberfill that’s at the bottom of your two corners and gently pull the other section over it and staple. Working from the middle means you will have balanced fiberfill at three points on each edge, so it will stay even as you finish stapling. With the center secured, work in either direction using the same motion, adding a staple every 2” to 3”. Repeat this process on the other side, and you will end up with an encased cushion that looks like the image to the right. With heavier covering fabrics, this step may not be necessary but it may still be helpful to "clean-up" the cushion before putting it in its case. Using scissors, trim off any fiberfill extending beyond the edge of the cushion, as shown in picture 5-1. Be careful not to trim so close to staples that they lose their hold or are cut out altogether.